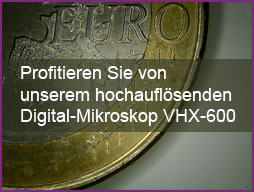 Benefit from our high-resolution digital microscope! In order to fulfil the demanding requirements of our quality assurance, we utilise modern high-precision measurement technology, which is now available for your own inspection tasks. Our “Keyence” triple CCD digital microscope VHX-600 is able to generate extremely clear, three dimensional, high-resolution images with a large depth of field. 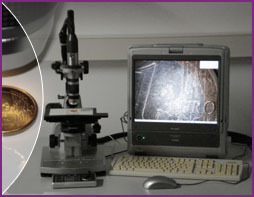 Hence this microscope can demonstrate its superiority in particular when used to analyze three dimensional specimens. Thus even objects with considerable vertical height will appear clear and sharp if using the VHX-600. This instrument allows real time measurement of distances, radiuses, angles and areas as well as volume determination and three dimensional measurements between planes and their included angles. Furthermore the VHX-600 is equipped with video recording features to provide an insight into time variable processes at the specimen. This profile projector serves as supplement measurement method for microscopes. 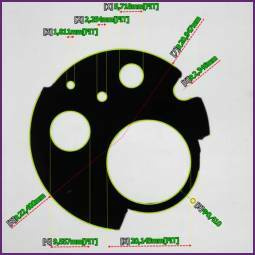 Especially measurements of length, radius or angles for greater objects (up to 100 x 200 mm) can be applied with an exactness of ±7 µm, in a highly-precise measuring modus up to ± 1,5 µm. At the same time measurements of various examination characteristics of an object can be fullfilled with one single touch of a button, using preliminary defined measuring methods. This leads to shorter measurement periods. This method also is not subject to user-related variation, and works independent from the respective applicant. The built-in coaxial light helps to easily recognize and measure contours on the item surface. Several objects of the same sort can be measured at the same time without having to specially adjust or focus them. Furthermore, the projector allows measurements with very high depth of focus without any influence through altitude differences or uneven surfaces. The device possesses an automatic pattern search to simplify the search for objects to be measured.